bookoxygen’s latest extract is an unpublished short story by a gifted writer featured on this site once before. ‘Prelude in E Minor’ is a stylish, witty comment on the solipsism of one woman preoccupied by her own circumstances. Whether you write or not, whether you are houseproud or not, whether you like dashes – or not – here is a brief fictional excursion to savour. The room was messy and silent. Karen found that by concentrating on isolated bits of mess, by abstracting them, she could inure herself to the whole; elevate, even, those domestic components – the sticky jam-jar with its excretions of mulberry; the fallen slice of wholemeal bread; the soldierly ants carrying off slivers of crust like captives on litters – to individual, epigrammic tableaux. This was, she thought, a metaphor for life. It was five in the morning and she needed a metaphor to lean on. The day before she had been to see an agent. She had chosen something flattering but dark, black, in fact, to wear, so as not to seem frivolous. She had warned herself to be brief – the tart scent of enigma outlives the cloying musk of chatty agreeableness – but she had succumbed, seated opposite the woman who might be her springboard, to a half-hour’s mirthless monologue. The agent, harried looking, a smoker, had glanced at her wristwatch a fifth, sixth time, and yanked the typescript from Karen’s arms like an orphanage director an unpromising foundling. ‘Short stories are the hardest to place,’ Eunice muttered. Short stories were not, to belabor the metaphor, the blue-eyed, corkscrew-curled darlings of the baby industry. They were dark, hopeless. ‘But –‘ Eurnice sighed. She flicked through the pages. ‘No dashes, anyway –‘ It took Karen a few minutes to comprehend. Then she was outside, on her way home. It was her only outing in weeks. He – Tom – (into her next story she would fling, rebelliously, as many dashes as possible) – neglected to say, ‘So, how did it go?’ and Karen therefore sulked for the rest of the day. She turned to the solace of drudgery and, dragging out the vacuum, hoovered in places generally left undisturbed. She tried to block out the image of someone, perhaps a treble-chinned someone, with a paunch like a mudslide tucked into perma-press – or a rigidly thin, long Venetian nosed someone, with little sense of humor and a cold coming on – glassily regarding her neatly-typed pages. She shivered and winced as though they were leafing, with their tongue-moistened fingers, through layers of her own, excessively thin skin. She imagined her reader disliking a turn of phrase, or frowning annoyedly over an image, muttering, ‘Jesus,’ and slapping the thing down; reaching for the bologna sandwich. They were picking up the carpet of her life, and she was under it, cringing. She worked the hoover without mercy, savagely mowing stripes into the close-cropped wool. The whole of the next day, she lay there. She clenched her eyes shut. She made fists with her hands and brought them to her chin. The sun blazed again. Would she come to the phone? She would not. She slept. In a gathering dusk – was it still the third day? She woke up briefly. He was going, he said. Would she be alright? ‘I have to leave now’ – he looked at his wristwatch in illustration. She closed her eyes. He left. On the fourth day, someone came to the door. ‘Karen?’ he called. She lay there, thinking not to reply, but he would not go away. It was Arkady, the piano teacher. Sorry as she felt for herself, she felt sorrier for him. She went to the door and unlocked it. He did not seem in the least appalled by her appearance. She always looked like this, perhaps? Wait, she said. She went to the bathroom and washed her face. She put on cologne and pants and a shirt. ‘You have practiced?’ Arkady said. He looked around for something damaged. It was, lately, more and more like this, with all of his pupils. They were unprepared, they were broken down, and, flinging their compassion for themselves over him as well, like a moth-eaten blanket or a butterfly net, they did not release him, but bagged him and bid him play. That sad one. He launched into Chopin. 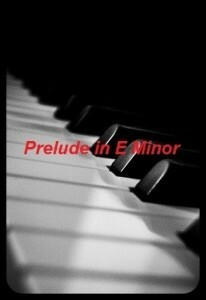 ‘Prelude in E Minor,’ he said. ‘Opus 28. No. 4.’ . She swung out at a stack of folders and stray pages fluttered to the floor. He liked the word. It had a Russian sound. There were twigs and bits of bark on the back of his jacket. ‘Have you been lying in a field?’ Karen asked. He volunteered nothing more, simply sat on with his back to her, bowed, and she, although giddy from her new agoraphobia, was sufficiently collected to not pry. It came to her suddenly that he had his sorrows, which he had taken to a cemetery, and were therefore doubtless greater than hers, which were simply to do with words – and dashes.